The Pool Patrol floating pool alarm has adjustable sensitivity. The shipping process has been known to affect the calibration, so it advised that you adjust the sensitivity immediately upon receiving the unit. 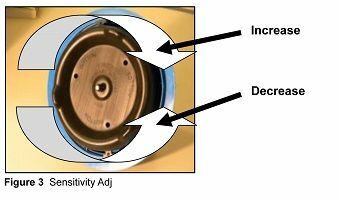 Clockwise = increased sensitivity. The pool alarm will sound from smaller objects or subtle disturbances. Turning the base clockwise until it stops (do not force it) will result in the MOST sensitive setting. Counter-Clockwise = decreased sensitivity. The pool alarm will NOT sound for small objects and disturbances, but will still sound for larger objects. Turn the base ¼ turn at a time and test each setting until the desired sensitivity is achieved. 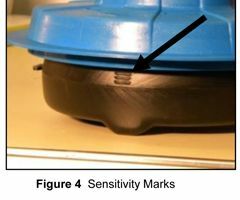 The sensitivity marks on the side of the black flotation base can be used as an indicator of the sensitivity level. Deploy the pool alarm and enjoy pool safety peace of mind! Note: We do not recommend turning the flotation base more than 3 full turns in the counter-clockwise direction. You may find that one setting is ideal for regular use when the surface water is placid, however, it may cause false alarms if there are winds greater than 12 MPH or during a storm. To avoid false alarms, you may decide to temporarily decrease the sensitivity. You should then retest your alarm at the new setting to verify that it will sense the child or pet you wish to protect at all areas of the pool.